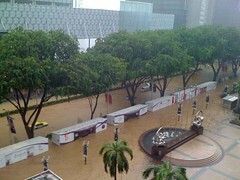 Orchard Road is a road in Singapore that is the retail and entertainment hub of the city-state. It is regularly frequented by the local population as well as being a major tourist attraction. Often the surrounding area is known simply as Orchard. The immediate vicinity of Orchard Road, Orchard Planning Area is one of 55 urban planning areas as specified by the Urban Redevelopment Authority, and is a commercial district. It is part of the Central Region, and Singapore’s central business district, the Central Area.